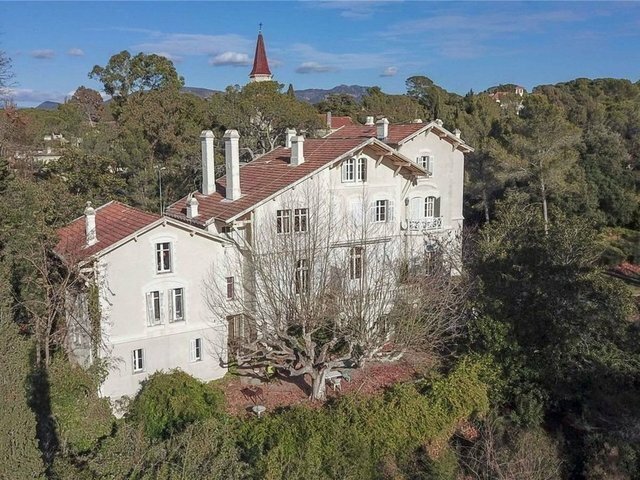 An immense English style villa built in 1884, of approximately 689 sq m, ideally located in the sought after residential area of Valescure, Saint Raphaël. For sale via Savills Nice. A historic Belle Époque property of approximately 689 sq m to renovate, benefitting from an excellent location in the residential area Valescure, Saint Raphaël. Accommodation is arranged over 4 floors, with all rooms benefitting from high ceilings and natural light. The ground floor comprises an entrance hall leading into a reception lobby, a cloakroom and a North facing artists's studio with mezzanine. In addition to a principal reception room opening onto a South facing terrace, the villa boasts a music room, a dining room, a kitchen and pantry, and a further, smaller reception room. The first floor offers 5 bedrooms sharing 2 bathrooms, 1 of which includes a dressing room. The second, top floor, comprises 2 bedrooms in a private hallway sharing a bathroom, 2 further bedrooms each with dressing rooms, and a central guest's lounge with the potential to be used as a bedroom. Also situated on this level is a bathroom and a technical room with boiler. At basement level the property features a wine cellar, an orangery, a boiler room and independent access to the gardens. Situated on this level is an entirely renovated caretaker's apartment composed of 2 bedrooms, a lounge, a bathroom and a kitchen. The property exterior offers a swimming pool, a pergola, and extensive parking. Nestled in a protected park grounds of approximately 6,200 sq m, (requiring work) the property benefits from a private, natural setting. Agency fees payable by the seller. Saint-Raphaël is a historic coastal town in the Var region, situated between Cannes (41 km) and Fréjus (3km). Its modern rail station, Saint-Raphaël-Valescure, offers national, regional and local services and is on the TGV route between Nice and Paris. Valescure is a sought after, residential area set in the heights of the city, and is home to traditional cottages, countryside lanes and Provençal villas. Nice International Airport is situated 45 km to the East, and Marseille International Airport 118 km to the West.